Nobody is confused by the fact that we don’t use a Ferrari 458 Spider sports car as a dump truck. Nobody is astonished that a Toyota Prius did not qualify for the Indianapolis 500 race this past May. And nobody whom I know drives a Caterpillar earth-moving truck back and forth from home to work (…but, I have to admit, it might be really cool to try – Outta my way, I’m coming through!). We’re not confused by these things because most of us have automobiles and we are generally familiar with the notion of different vehicles being designed, built, and used for different purposes. In a number of different articles I’ve repeatedly stressed the notion that form follows function and function follows mission requirements. The mission requirements for a Ferrari are different than those of a Prius or those of a giant piece of mining equipment and so the resulting products are dramatically different. The same concept of differentiation applies to rocket engines. That’s obvious, right? On one end of the spectrum, you have something like the F-1 engine used for the Saturn V launch vehicle. It had a thrust level of 1.5 million pounds-force of thrust and a specific impulse of about 260 seconds (sea level). It stood nineteen feet high, at the base of the nozzle was over twelve feet in diameter, and it weighed over nine tons. On the end of the spectrum (at least the spectrum that we deal with within LEO), you have the RL10 which, depending on the specific configuration, puts out less than 25 thousand pounds-force of thrust but has a specific impulse over 450 seconds (vacuum). If you have an RL10 without the big nozzle extension, the engine is just over seven feet tall, about four feet in diameter, and it weighs less than 400 pounds. Yes, that’s a flood of numbers, but let me make it a bit more graphic. If we wanted to get the same thrust level using RL10 engines as was obtained on the S-1C stage of the Saturn V (which used a cluster of five F-1 engines), then you would need 336 RL10 engines. That would be an interesting vehicle configuration indeed. Alternatively, try to imagine the Centaur upper stage – the typical use for the RL10 – with something as big F-1 hanging off the end. The whole stage weighs less than five thousand pounds (dry) and is just over forty feet long. If you tried to apply 1.5 million pounds-force of thrust to something like that, then in just fractions of a second, the whole stage would be a shiny metal grease spot in space. I know, I know. That all looks like a meaningless, banal listing of numbers. Specifications rarely seem interesting unless or until you know the stories behind the facts. So, let’s discuss the stories. First of all, they’re both hydrogen engines. Why? Because they both need to have high specific impulse performance at high altitude and in space. The difference between these two engines is that the RS-25 is a sustainer engine whereas the J-2X is an upper stage engine. The RS-25 sustainer mission is to start on the ground and continue firing on through the entire vehicle ascent to orbit. The J-2X upper stage engine mission is to start at altitude, after vehicle staging, and propel the remaining part of the vehicle into orbit. Also, an upper stage engine can sometimes be used for a second firing in space to perform an orbital maneuver. This difference in missions accounts for the difference in raw power. The RS-25 is part of the propulsion system lifting a vehicle off the ground. It needs to be pretty powerful. The J-2X is the propulsion system for a vehicle already aloft and flying quickly across the sky. The difference in missions is also largest part of the explanation for the different engine cycles used. 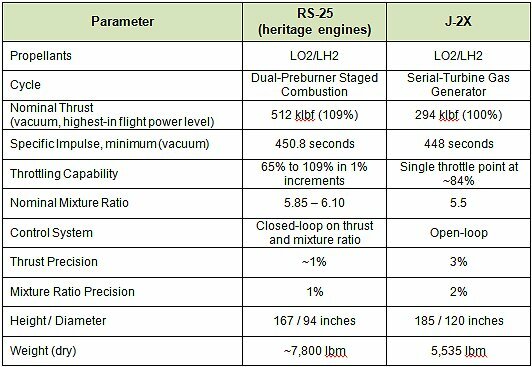 In past articles, I’ve discussed the schematic differences between a gas-generator engine like the J-2X and a staged-combustion engine like RS-25. The staged-combustion engine is more complex but it generates very high performance. You may look at the two minimum specific values, 450.8 versus 448 seconds, and say that these are not very different, but remember that the J-2X cannot be started on the ground. If we tried to start the J-2X on the ground, the separation loads in the nozzle extension would rip it apart. The RS-25 achieves this very high performance without a nozzle extension because, well, it had to in order to fulfill the mission. Note that a ground-start version of J-2X would have a minimum specific impulse of something like 436 seconds. Something else that is significantly different between the two engines is their throttling capabilities. The J-2X can perform a single step down in thrust level. This capability can be used to minimize vehicle loads or as part of a propellant utilization system since the throttle is accomplished via a mixture ratio shift. The RS-25, on the other hand, has a very broad throttle range. Why? Two reasons. 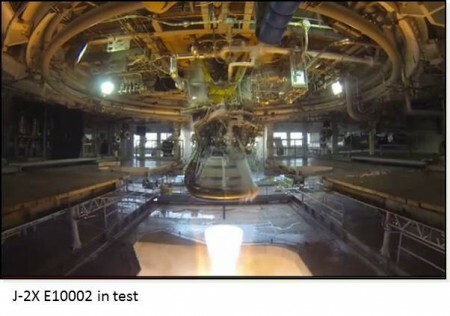 First, because during the first stage portion of any launch vehicle ascent, the vehicle experiences what’s known as a “max Q” condition. 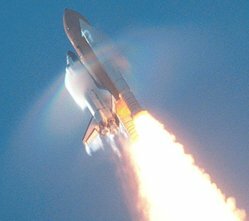 Perhaps if you’ve ever listened to a Shuttle launch in the past you’ll hear the announcer talk about “max Q” or “maximum dynamic pressure.” This is the point at which the force of the air on the structure of the vehicle is greatest. It is a combination of high speed and relatively dense air. Later, the vehicle will be flying faster, but at higher altitudes, the air is thinner. Thinner air means less pressure (the equation – thank you Mr. Bernoulli – says that dynamic pressure is proportional to the air density and to the square of the vehicle velocity). Thus, to minimize structural loads on the vehicle, the engines are throttled down deeply for a short period of time, and then brought back to full power. An upper stage engine operating only at high altitudes never has to face a max-Q condition. Second, a sustainer has to be big enough to contribute to the lift off of the ground, but at higher altitudes, after the vehicle has been emptied of most of its propellants, with too much thrust you’ll get too much acceleration. If you had no way to throttle back the engine thrust levels, then the vehicle would accelerate beyond the capacity of the astronauts to survive. An upper stage engine does not generally start out with as much oomph so the throttling needs to lessen acceleration loading is not as great. Lastly, let’s talk about differences in engine control. Engine control typically refers to the parameters of thrust level and mixture ratio (i.e., the ratio of propellants, oxidizer to fuel, being consumed by the engine). When we talk about thrust, we are talking about throttling as discussed above, yes, but also thrust precision, i.e., the capability of the engine to hold tightly at a particular thrust level. When we talk about mixture ratio, we’re generally talking only about the notion of precision (but below in a post-script I’ll tell you a little more with regards to RS-25). Well, what would cause an engine to stray away from a fixed operational condition? Two things: boundary conditions and internal conditions. The most obvious boundary conditions are pressure and temperature of the propellants coming into the engine. 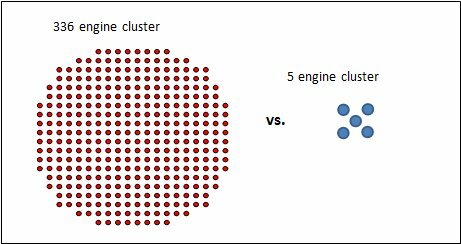 A sustainer engine can see a wide variation in propellant inlet conditions due to variations in vehicle acceleration. This is most dramatic during staging activities. An upper stage engine won’t typically see these wide variations. This is why it was very, very useful (almost necessary) for the RS-25 to be a closed-loop engine. 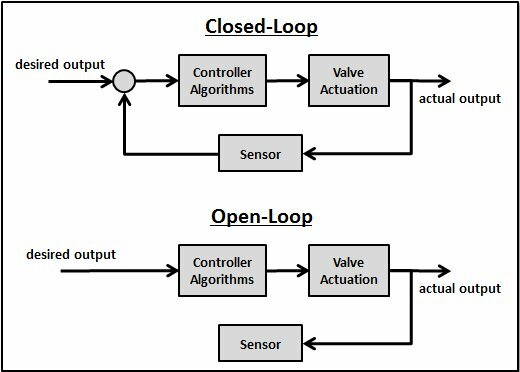 A closed-loop engine uses particular measurements for feedback to control valves that, in turn, control engine thrust level and mixture ratio to tight ranges. The RS-25 holds true to the set thrust level and mixture ratio regardless of propellant inlet conditions. The J-2X, on the other hand, is an open-loop engine. The thrust and mixture ratio for J-2X will stray a bit with variations in propellant inlet conditions. Note that this “straying” is predictable and is built into the overall mission design. Because the upper stage engine won’t see the same wide variations in propellant inlet conditions, this is a plausible design solution. The different control schemes for the two engines are also the reason as to why the noted thrust and mixture ratio precision are different in the table above for the RS-25 and the J-2X. Every engine runs slightly differently from firing to firing. These are usually small variations, but they are there. This is part of the “internal conditions” factor in terms of an engine straying from a fixed operational condition. A closed-loop control engine can measure where it is with regards to thrust and mixture ratio and make corrections to accommodate and compensate for slightly different internal conditions. An open-loop engine like J-2X cannot make these accommodations and so it will have a wider run-to-run variability even if everything else remains the same. Note that we could have made J-2X a closed-loop engine. We made the specific decision to not go that way based upon a cost-benefit analysis. Simply put, closed-loop is more complex and, therefore, more expensive to develop and implement. We conducted a trade study, in conjunction with the stage development office, and decided that the benefits in overall stage performance did not justify the additional development and production cost. For RS-25, given its mission, it really had to be closed-loop from a technical perspective to enable the Space Shuttle mission. Plus – thank goodness for us today – the RS-25 control algorithms are validated and flight-proven as we head into the Space Launch System Program. That’s a nice feature of using a mature engine design. So, that’s a top-level comparison of our two engines that we’re managing for the SLS Program. They have a number of common features, which is not surprising given that the SSME design grew out of the original J-2 experience forty-some years ago and the J-2X was developed, in part, with thirty-some years of SSME experience behind us. But they are also quite different machines because they were designed for different missions. 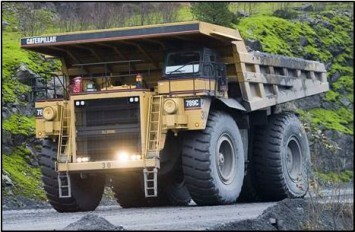 No, this is not a case analogous to the comparison of a Ferrari and a dump truck. It’s more like, perhaps, a Bugatti Veyron and a Lamborghini Aventador. Each is just a remarkable creation in its own right (…and I’d probably be reasonably happy with either in my garage…). Post-Script. A quick note about mixture ratio control and RS-25. You will note that the mixture ratio is shown as a range in the table of characteristics up above. The RS-25 can be set to run at any mixture ratio within that range. This is a nice accommodation for stage design efforts today as part of the SLS Program, but that’s not why the range exists. The original design requirements for the SSME included not only the provision for variable, controllable thrust level in run, but also for independently variable and controllable mixture ratio during engine firing. This fact, in turn, explains the rather unusual engine configuration of having two separate preburners, one for the fuel pump and one for the oxidizer pump. I’ll tell you why. Think back to basic algebra. 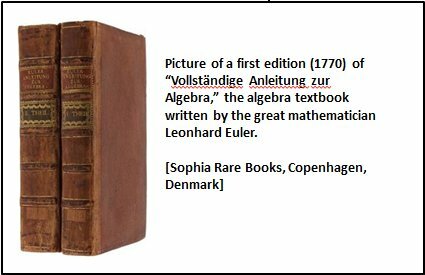 Remember when you had to solve for a number of variables using several equations. The mathematical rule of thumb was that you had to have as many independent equations as there were variables or else you could not arrive at unique solutions for each variable. The same principle is applicable here. With two separate, independently controlled preburners (and therefore independently controlled sources for turbine power), you can resolve to independently control two output parameters, namely thrust and mixture ratio. That’s pretty cool. But here’s the interesting historical part: We never actually used the shifting mixture ratio in flight. As the vehicle matured, it was decided that the mixture ratio shifting capability was not needed. But the design and development of the engine was too far down the road to backtrack and simply. Thus, we have a dual-preburner, staged combustion RS-25 engine. Post-Post-Script. 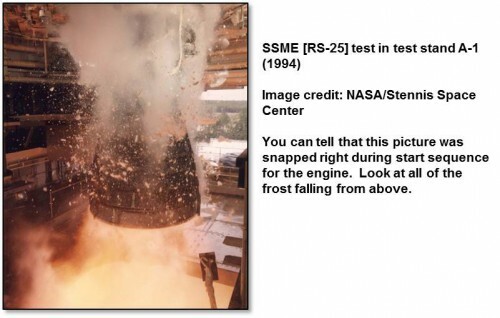 A number of years ago as part of the SSME project, for some specialized development testing, we did actually invoke the capability to shift mixture ratio in run on the test stand. So we have demonstrated this unique capability on an engine hot fire. There just wasn’t ever any reason to use it as part of a mission. Interesting. That’s a really cool explanation of the engines used in the SLS project! I look forward to more blog posts about the Space Launch System! I’m not clear what you mean by “starting it on the ground”. Aren’t you “starting it on the ground” on the test stands? If you went over it before, sorry! I did a quick search through previous articles, but my search-fu failed me. @Bryan: Thank you for your comment and your enthusiasm. @Aaron: Thank you for the question. And, yes, I did focus an article on this topic way back in an article posted on 3 February 2012. It’s a matter of supersonic flow and the Bernoulli Equation and stuff like that. Check the archives. The short answer is, no we do not start the J-2X on the ground for our test program if you define “J-2X” as the intended flight configuration. What we do test is the J-2X in a test configuration. For sea level testing without a passive diffuser (i.e., on test stand A-1), the test configuration means that we do not have any nozzle extension. For testing with a passive diffuser (i.e., on test stand A-2), our test configuration can include a stub (shortened) version of the nozzle extension. The only way that we can ground test the complete flight configuration is if we use an altitude simulation test stand. Interesting to see the differences between the RS25 and the J2X, but it leads me to ask another question. The J2X uses gas-generator to drive the pumps, whereas the RS25 is a staged pre-burner. Could the turbine system on an engine like the RS25 be uprated to drive extra pumps, and thus act as the pump system for the J2X? That is, an RS25 as the central engine and pump for 4 surrounding J2X engines? Or is that essentially what you have anyway? @ Russell N: Remember that the RS-25 and the J-2X would be operating at different phases in the flight. The RS-25 would be functioning during the first and sustainer stages whereas the J-2X would be functioning as the second stage engine. Thus, their operation is sequential rather than concurrent. But is that representation the only possible architecture? No, of course not. All that one has to do is take a look at what the Soviets/Russians/Ukrainians did over the years to see a different perspective. In several cases their concept of an “engine” was a single pumping unit feeding several injector/chamber/nozzle sets. If you have one set of turbomachinery but four inject/chamber/nozzle combinations, is that one engine or four? The answer probably doesn’t matter. The paradigm is just different. 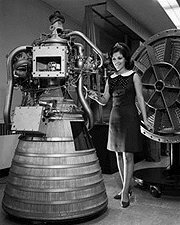 Back in the late 1990s, we worked with Rocketdyne towards the development of a linear aerospike engine called with XRS-2200. In this case you had one set of turbomachinery (basically J-2S turbopumps), driven by one gas-generator, feeding 20 separate combustion chambers (two rows of ten each). One of the technical tricks to overcome in such a situation is this: how do you light twenty chambers in a sufficiently concurrent and controlled manner? Not necessarily an easy issue, but one where a solution was found. So, there are numerous circumstances where our usual notion of what we mean by “rocket engine” fits just fine. But we need to remain open-minded enough to consider alternative architectures for unfamiliar or unique circumstances. Incidentally where does the extra weight in the J2X vs the J2 come from?